Today we got our copy of V-Jump and immediately began translating the material and first translation is from yesterday’s leaked Dragon Ball Xenoverse scan. 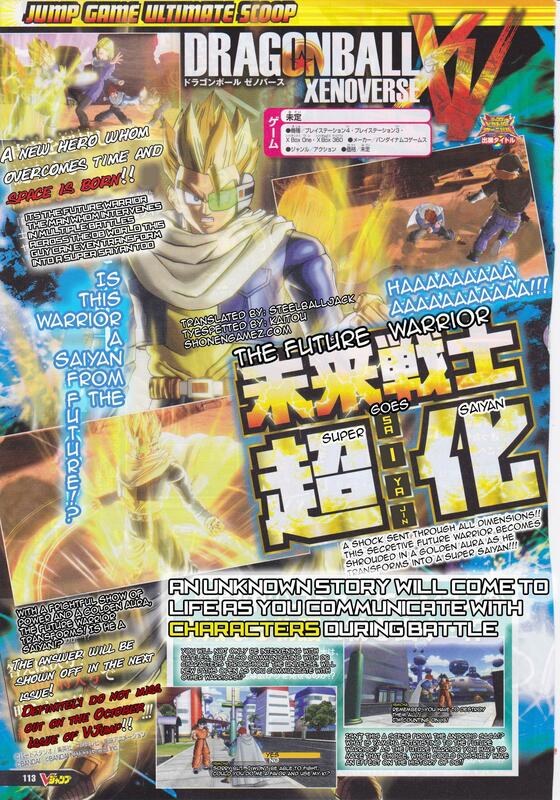 According to the scan, the Future Warrior will be able to intervene battles in the Dragon Ball universe. The bottom of the scan mentions that you will be able to make choices in the story mode and depending on those choices, it could have an effect of the history of Dragon Ball. Why Do Fans Insist On Asking For Non-Weekly Shonen Jump Characters In J-Stars? Bro This Is Why I LOVE SHONENGAMEZ, You Guys Are The Best. Awesome GTZ I can’t wait for more! Also guys to make the image bigger be sure to right click and press “copy image url” and paste it on your url bar. October is next months VJump so literally a month away today lol! This typesetting is beautiful. Great job, really. Yeah … no it will not be split screen multiplayer it will be like the Naruto Ninja Storm games I mean the local multiplayer and it would be awesome to team up with you’re friend against other players or computers ! Btw how much does a subscription to this magazine cost in the u.s. ? You can only get it at Japan. .. why dosen’t saiyanislanlet us mention your site? :0 mind blown, wait you mean the one from the stage demo? No, we made a character list image with all the character icons. They took it from us and only credited Dei and not us for the image we made. Woah harsh… um could I see it? Not going to link it but going a couple pages back on their site you’ll see they took our screen we made. Really hope what if characters make an appearance. The way they market this, my dreams is becoming more of a reality. ModernWarNegro’s website wrote about this scan and didn’t credit us either. Interesting.